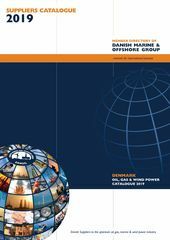 was the fundamental idea behind Danish Marine & Offshore Group (DMOG) when the association was created in 2001 as a sales network for suppliers and manufacturers within the offshore and marine industries. Today, the association still works according to this idea. The goal of the association is to create a new platform for cooperation and knowledge sharing across trade lines matching the latest customer demands, and to promote Danish export of marine and offshore products by creating joint system solutions. DMOG’s members’ target group comes from the offshore or shipping industries or are ship builders connected to the offshore sector. Today, these customers are to a higher extent looking for system solutions rather than single products. Due to global competition and demand for greater cost efficiency, the oil and gas industry looks for new innovative ways of doing business, for example alliancing, outsourcing and partnering. Knowledge sharing and cooperation between manufacturers and suppliers through networks like DMOG create synergy and innovation of great advantage to customers. Moreover, cooperation strengthens the image and visibility of the individual company. This will create new growth perspectives and increased earnings for the company. Continuously, DMOG is looking for new members to strengthen the association. Read much more about membership and how to become member here.